The Westin Lagunamar Ocean Resort Villas & Spa is your spot to enjoy all the finest luxuries of a Cancun vacation with accommodations at optimal comfort in the renowned Hotel Zone. SellMyTimeshareNow.com can help you find your next dream home-away-from-home at a fraction of the developer cost! The crystal-clear Caribbean waters will never leave your sight at Westin Lagunamar Ocean Resort. 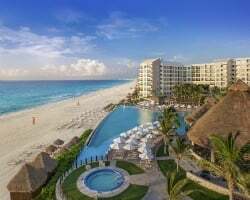 The Westin Cancun villas offer the best views of breathtaking Mexico beaches the area is known for. Enjoy majestic fountain pools, unwind at the Heavenly Spa by Westin, or watch the sunset over the ocean from a relaxing jacuzzi. It’s all waiting for you right outside of your timeshare villa door! Westin Lagunamar is the perfect getaway for those looking for a romantic rendezvous or simply a sweet escape from the everyday grind. Take part in fun interactive activities like a poolside fashion show, tequila tasting, or sarong tying demonstrations. You and your significant other can learn to speak Spanish or take salsa dancing lessons. Once you admire the breathtaking sunset, set off on a course through Cancun’s unbeatable nightlife! Families are also welcome, as kids will especially love the waterslide races or the Mexican cooking lessons available. Westin Lagunamar provides around-the-clock fun. Enjoy a day at the beach with your travel partners, and then by night you can enjoy movies at the pool with the kids or embrace the energetic nightlife Cancun is known so well for. And that’s not all! Call us today at 1-877-815-4227 or fill out the form on the right for more information on what this fabulous resort has to offer. Purchasing a Westin Lagunamar timeshare on the resale market will help you avoid paying any unnecessary hidden fees that could be tacked onto your ownership price when you purchase a unit through the developer. 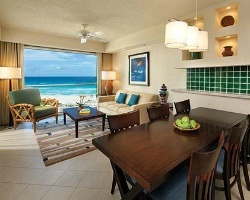 Because of this, buyers have acquired Westin Lagunamar Ocean Resort timeshares at up to 70#&37; off the cost with us. And you can too! Ownership of Westin Lagunamar Ocean Resort timeshares come in the form of fixed or floating weeks. Floating weeks are available in Gold Plus, Platinum and Platinum Plus seasons, and usage is annual or biennial. Browse our inventory and choose the type of ownership that best fits your desired vacation schedule. Like most other Westin resort locations, Westin Lagunamar Ocean Resort is owned by Starwood Vacation Ownership. Westin Lagunamar also offers Right To Use contracts, meaning that you are leasing the timeshare property, typically between 20 and 99 years, depending on the contract. Some Westin resorts are also eligible for StarOptions, which allows owners to use a points-based exchange system to vacation at other resorts in the Starwood network. Although Westin Lagunamar is not eligible for StarOptions, that doesn't limit owners to being able to travel the world. Instead, they turn to external exchange options. Interval International is the premiere external exchange affiliate of both Westin and Starwood. Westin Lagunamar timeshare owners can purchase a membership and submit their timeshare week into the exchange pool, granting them access to other weeks at resorts worldwide for a one-off vacation. With Westin Lagunamar having an Interval International Elite Resort rating, you’ll have a huge advantage in trading power. This will allow you to vacation virtually anywhere you desire. This stunning Cancun resort is surrounded by beautiful beaches, clear ocean water, and some truly amazing activities right there in front of you. Stay active with any of the resort’s divine amenities including tennis courts, mini-golf, or the pools. Relax after a long day in the resort's arcade room or relax your muscles in the steam room. Westin Lagunamar keeps things fresh and fun with water-based activities like jetpack adventures, surf schools, and tarpon fishing. Rent yellow bikes and take scenic tours along the coast or hit some of the local shopping areas like Kukulcan Plaza, Plaza la Fiesta, and La Isla shopping mall. Interested in some of the indigenous aquatic life? Visit the Interactive Aquarium or dive in head first at the Cancun Scuba Center! Of course, what trip to Cancun is complete without a trip to the Yucatan Peninsula. People come from all over the world to marvel at this architectural beauty, relish in its history, and even take some great photos to show off to your friends and family when you return home! 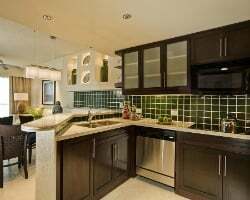 Already Own at Westin Lagunamar?